Is it safe to drive with the Airbag Light on? You are starting your car, and suddenly the Airbag Light appears on your instrument cluster. You are wondering if you can continue to drive your car, but what will happen if you are getting into an accident with the airbag light ON? In this article, you will get the answer to that, and we will discuss a bit of how an airbag works and learn if you can fix it yourself at home or you have to let a mechanic repair it. Will the Airbags work when the airbag light is on? It is not safe to drive with the airbag light ON. When the light is on, it means that there is a problem with the airbag system. When there is a problem with the system, it will not deploy the airbags at all in an accident. It is always recommended to repair the problem as soon as possible. 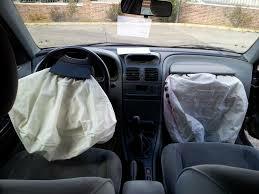 If your airbags are not functional in a crash, it may cause death or serious injuries. When your Airbag light appears on your instrument cluster, it means that there is an error in your airbag system. It could be everything from a damaged airbag, broken wires, bad connections or a faulty control unit. To find the problem the easiest way is to check the trouble code memory with an OBD2 scanner. If you have an error in your airbag control unit, your airbag will not work in a collision. When an error occurs, the airbag control unit is shutting the whole function for your safety. It is because the airbag system is susceptible. That is because you do not want the airbags to blow in your face for a false alarm because of a broken wire or a bad connection. A false alarm airbag explosion may cause serious injuries to you if there is not an accident. It will not damage any further parts in the airbag system or do any other damages to your car, but it can for sure do serious injuries to you! How does the airbag know when an accident occurs? Your airbag system contains a control unit, several sensors, and several airbags. You usually do have crash sensors in the front and the sides of the car, some vehicles have more than others. When a crash sensor is triggered, it is sending the signal to the airbag control unit. The airbag control unit is then sending a signal to the airbags inside your car, and telling them that there is an accident and they get triggered and explode. All of this happens in milliseconds, pretty impressive. What is the most common problem if my airbag light is on? The most common problem if your airbag is ON, is a bad connection inside any connector. The airbag control unit has minimal tolerances, and a bad connection will trigger the airbag light, and it will shut off the system. Usually, the airbag control unit is having a tolerance of 3-5 ohms of an airbag, if you have a bit of corrosion in a connection, you will get over 5 ohms, and the light is triggered. The most common problem is the plug connector under any of the front seats. The plug is moving slightly forward and backward when you are pushing the car seat back and forward often, and it will cause bad connections. Usually, it is enough to spray a bit of electric cleaner in the plug and plug it back. But you should always read the trouble code memory with an OBD2 DTC reader when your airbag light occurs. With airbag systems, you will often get a particular code. Is it safe to work with the airbag system at home? As long as the airbag light is ON and there is an error code stored, the airbags will not blow in your face. But you should always remove the battery connection when you are working with your airbag just in case. You should still be very careful when you are working with your airbag system repairs. You should always do the recommended repairs from you repair manuals. You do not want to make wrong solutions, and it could eventually trigger the airbag when you are out driving, and you do not want it. If you are a bit familiar with car electrics, you can fix it yourself if you do it with caution. Will my airbag/SRS light disappear by itself when I’ve fixed the problem? No, the airbag control system is designed like that you have to erase the trouble code manually before the airbag light goes away. It is because of a safety purpose like I wrote before. To delete the trouble code, you have to use an OBD2 scanner. You have to use an OBD2 scanner that can search through the airbag system on your car. The most cheaper OBD2 scanners will only read the engine control unit, and you have to get a more expensive scanner that is compatible with your vehicle if you want to do it yourself at home. You could also let a mechanic remove the trouble code, and it will usually just take 1 minute or two. 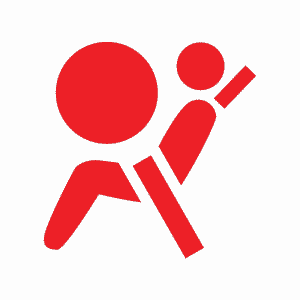 When you Airbag light is ON – Your airbag function will not work. A common cause is a bad connection in the plug under your front seats. You can repair it yourself if you are familiar with car electronics and you are careful and read the repair manuals. You have to erase the trouble codes after any replacements for the light to go off. If you have any other questions about how the airbag system works or how you can repair it, you can comment down below, and I will answer your questions as fast as possible. If you have any other car questions, you can ask them for free at our homepage. If you want to find more dashboard signs, you can check out the article Dashboard Warning Lights. What does the SRS light mean? How to Fix A Broken Seat Belt Buckle? @Yohanes negash If the “Airbag Off” light is on, check on the passenger side if there is a switch to turn the airbag on and off on the passenger side. Else, you have to read the trouble codes from the airbag control unit to locate the problem. I would check for any water or corrosion on wires or wire plugs to crash sensor and airbag control unit. Check the trouble codes with an obd2 scanner is my best suggestion! Could the airbags explode by themselves when the Srs light comes on without being in an accident? Just by turning the car on and driving it? @Carmen When the airbag light is on, The airbags will not explode. If you erase the trouble codes when the fault still occurs, they can explode if you are very unlucky. My light is blinking. It isn’t staying on steadily nor is it blinking in any type of code. It is a steady blink. I’m aware that the airbags would not work in the case of an accident but I’m concerned that they may malfunction and go off randomly. I have tried scanning it as well as a few mechanics I know however none of the readers can read an airbag code. Shy of going to a Nissan dealership and spending tons of money for them to read it…which I can’t afford right now…I don’t know what else to do. I had disconnected the battery to reset it which seemed to work for a day or so then back to blinking. I have one of those kill switch things that the dealership put on in case of missed payments and it seems to have caused alot of electrical issues. Of course they say that they can’t do anything about it because it is a requirement of the finance company and no warranty on the vehicle itself. I just want to make sure that the airbags won’t randomly go off with it blinking like that and can’t seem to get an answer. If you can’t reach communication with the airbag control unit with any scanner while the light is blinking, it’s most likely a problem with the control unit or the wires (CAN BUS). While the problem occurs, you have to measure the power, ground and the CAN Bus to the airbag control unit. However, this is pretty advanced troubleshooting to do. If your airbag is flashing or light up on your dashboard, the airbag won’t deploy in case of an accident. You do not have to worry about deploying randomly as long as the light is flashing. If the light is flashing or light up, the function is completely turned off. I would advise you to look around for a smaller automotive electronics workshop. If your car is pretty new, ask Nissan if there is any warranty left. If the light was on before the accident, the airbags should not deploy. If it’s on now, you have to read the codes with a scanner and either erase it or fix the problem if there is any. You may also see crash data in the trouble codes. @PDR Yes, I have never heard of any car that would deploy the airbags with the lights on. However, for the seat indicator, you can often install a resistor with the correct ohm’s instead of the seat sensor if you are short of money. Airbag light on M.O.T failure so waiting for garage report and likely cost to correct fault. Still not bad 14 yrs old Peugeot Partner combie only major fault to repair front springs one broke and had both replacesd. What’s best to clean off adhesive of the headlight deflectors I have to put on each year visitng family in France. Plastic lenses rule out any abrasive type cleaner. Have you checked out the Valet Pro Glue? This with a Tar remover should do the trick. You can also do it with hot water in a lot of cases! I bought a 2004 chevy tahoe but the air bag on the driving wheel it’ was open like they just opened and glued again. Do you have any idea why is it like that? I would replace this one if you are unsure. It could probably be a technical service bulletin to fix something in the airbag, but I doubt it. If you are worried, replace it! If it doesn’t work properly in an accident, it may cause serious injuries. It sounds like you have a faulty wiring harness around the floor of the car. Under the seats you do normally have crash/acceleration sensor on the floor and this may be your problem when the water is pouring inside of the vehicle. My Toyota 2011 Camry’s airbag indicator will flash and stay for a few seconds and then disappear after I turn on the ignition. is this normal? also, I see on the indicator of both airbag OFF and ON, flashing and then disappear. The off is the driver’s seat. On in the passenger seat. should I take it to the mechanic to check? Reset Airbag Codes/Light without a scanner – Is it possible?